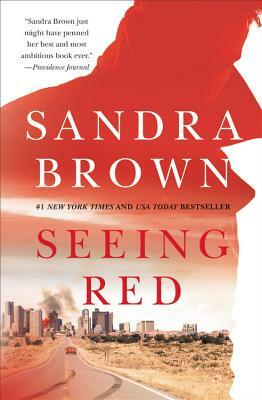 #1 New York Times best-selling author Sandra Brown delivers nonstop suspense and supercharged sexual tension in a thriller about tainted heroism and vengeance without mercy. Kerra Bailey is a TV journalist hot on the trail of a story guaranteed to skyrocket her career to new heights. Twenty-five years ago, Major Franklin Trapper became a national icon when he was photographed leading a handful of survivors to safety after the bombing of a Dallas hotel. For years, he gave frequent speeches and interviews but then suddenly dropped out of the public eye, shunning all media. Now Kerra is willing to use any means necessary to get an exclusive with the Major -- even if she has to secure an introduction from his estranged son, former ATF agent John Trapper. Still seething over his break with both the ATF and his father, Trapper wants no association with the bombing or the Major. Yet Kerra's hints that there's more to the story rouse Trapper's interest despite himself. And when the interview goes catastrophically awry -- with unknown assailants targeting not only the Major, but also Kerra -- Trapper realizes he needs her under wraps if he's going to track down the gunmen . . . and finally discover who was responsible for the Dallas bombing. Kerra is wary of a man so charming one moment and dangerous the next, and she knows Trapper is withholding evidence from his ATF investigation into the bombing. But having no one else to trust and enemies lurking closer than they know, Kerra and Trapper join forces to expose a sinuous network of lies and conspiracy -- and uncover who would want a national hero dead.